Here’s how we can create a simple pop-up window via the UIAlertView instance. It can have a title, some info text and several buttons (OK, Cancel, etc). We’ll only deal with one button and not worry about how to read out which button value has been pressed. 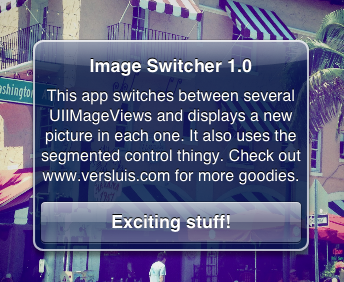 between several UIIMageViews and displays a new picture in each one. It also uses the segmented control thingy. You can add a \n for a line break inside the window.